You will laugh, be amazed and want to take them home. 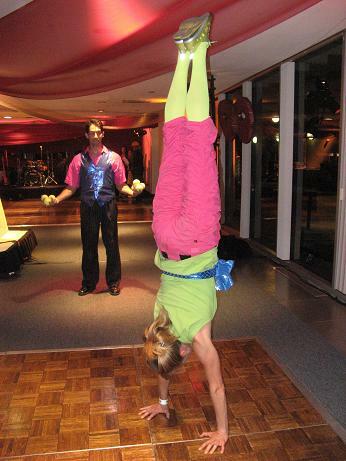 Check out this solo performer who has a variety of juggling/acrobatic skills. 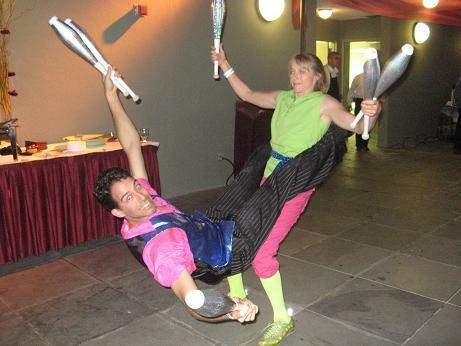 This award-winning dynamic duo delivers clean comedy and performs outrageous circus skills with members of your audience. You never know what you will see next. 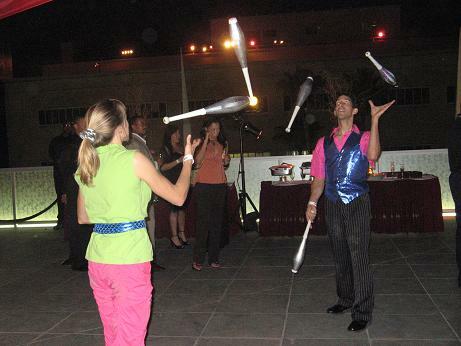 They can draw your portrait while juggling at the same time. Or turn your VIP into a basketball spinning superstar. Ever seen a synchronized flowerpot drill team before? They do that too. 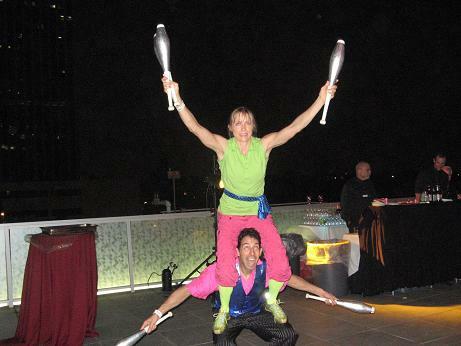 The “P” One Man Show of juggling, unicycle, balloons, stilts, fire, comedy for adults and kids. This show is unlike any other. 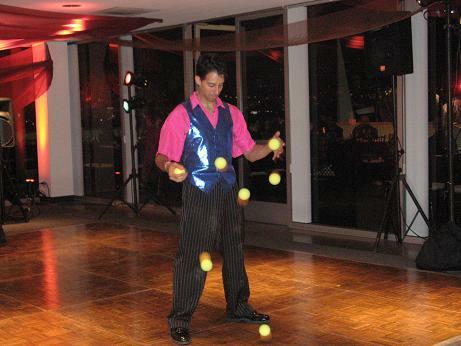 As the One Man Circus Band, he does it all to perfection, and he absolutely loves performing for you. It’s the ultimate audience experience — a journey we take together, as you are for sure to laugh and feel like kids again. Awe-inspiring tricks demonstrate what’s possible when we devote our time and energy to what we love and to making people smile. Great for kid and adult shows with a fantastic repertoire of puppets/characters. The show is usually an hour with audience participation at the end, especially for kids. My Ventriloquist and his wooden dummies and cartoon-like latex puppets have also appeared in family variety shows at big stage venues such as San Francisco s Palace of Fine Arts, San Jose Center for the Performing Arts, Oakland’ s Paramount Theater, the Anaheim Convention Center and on old vaudeville stages. His act features a BIG cast of characters, comedy, lots of audience interaction. His large cast of state-of-the-art wooden and “soft” puppet characters includes a wise-cracking state-of-the-art wooden dummy with striking facial animations who frustrates him at every turn. After several years of doing shows, he added walk around — using his very BIG cast of characters, which allowed him to do long engagements, rotating his cast of characters by visiting groups of people for short bits. Little People aka Dwarfs are great for specialty requests as characters, actors, elfs and other themes. Want a big Wow factor for a future event, hire one of our fantastic Strolling Girl Tables. 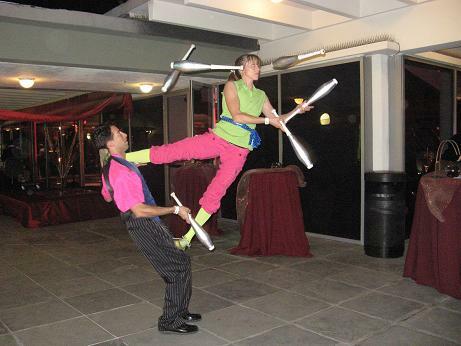 A wide variety of themes and costumes including LED lights, your guests will love it. Great for putting drinks and appetizers walking and mingling through the party with an assistant to replenish, clean and help move the table with the girl inside.